Zambia's government has denied that the country faces an economic crisis. Yet many Zambians suspect that the money it owes China is reaching unsupportable levels. Amos Chanda, a spokesman for President Edgar Lungu, told VOA that while Zambia may have economic issues, it is far from a debt crisis. "The economy is going at four percent. But that is not to say there is no economic problem. There are economic problems, but you can't call them a crisis," Chanda said. He also denied reports that Chinese companies were taking control of government property. "There is no single Chinese company taking over," he said. Chanda noted that Zambia received a $30 million interest-free loan and $30 million grant at the Forum for China-Africa Cooperation. The meeting was held last week in Beijing. Concerns remain high that China is seeking what some observers call "debt-trap diplomacy," with the goal of taking control of Africa's strategic assets. One such example comes from the Africa Confidential website. It published a story on Zambia's national broadcaster, ZNBC, earlier this month. It said that "the state-owned TV and radio news channel ZNBC is already Chinese-owned." However, investigative reports from local media show the reality is more complex. 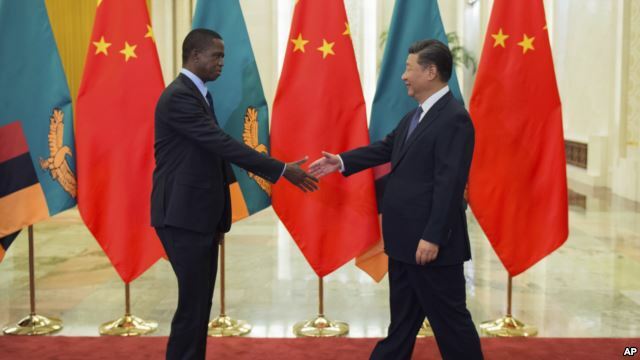 In 2017, another website, called Tumfweko, reported that the Zambian government and China created a joint project to digitize Zambia's broadcast services. It is called TopStar Communications Limited. The Chinese company Start Times owns 60 percent of TopStar, while ZNBC owns 40 percent. The company is overseeing the set-up of about 1.25 million set-top boxes throughout Zambia. The money it earns is being used to repay a $273 million Chinese loan for the project. Nick Branson is an expert on African economics, and a doctoral candidate at the University of London's School of Oriental and African Studies. He told VOA that it can be difficult to know which stories coming out of countries like Zambia are true. While the government would not like to sell assets, he said, it is not in complete control of its public finances. He added that Zambia is struggling to control the debt it has built up during the past three years. China has longstanding relationships with political leadership in Africa. While such ties are often seen as a sign of China's loyalty to Africa, they often do more harm than good. That is because African leaders often use these connections to seek out projects that only help the wealthy class. These countries usually face few protests from opposition activists, the public, or China itself, Branson said. Governments with well-defined national planning documents have had better success negotiating good deals with China and paying off their debts. The more a country understands its infrastructure needs, the more negotiating power it has, Branson said. A lack of openness also leads to problems, he noted. Branson said that neither China nor African countries want the details of their agreements made public. Resource-rich countries like Angola, a longtime China partner, have been successful because they are able to export materials that China wants. That makes it easy for them to get loans from China. In Angola's case, that's trade oil for infrastructure loans. But for smaller countries, repayment plans can be difficult. For example, some African nations may struggle to repay billion-dollar loans for railroad projects that will take many years to pay for themselves. Branson says it is possible that China might seize African assets. Still, he says, African countries unable to export farm products or other commodities will likely struggle to repay their debt in the long term. Salem Solomon reported this story for VOANews.com. Phil Dierking adapted the report for Learning English. George Grow was the editor. strategic asset - n. Assets that are needed by an entity in order for it to maintain its ability to achieve future outcomes.